What you say to yourself matters. More and more research supports the complex relationship between the mind and body and how thoughts can change how the body functions. When the mind is stressed, the body responds by changing every physiological system to deal with the perceived stress. Start in a tall standing position. The feet are approximately shoulder-width apart and the toes point forward. The knees align directly over the midline of the feet and extend no farther forward than the ball of the foot. The spine is in a neutral alignment and the head is in line with the spine. If one of your goals for participating in a fusion workout is weight management, it is important to understand how mental anxiety and physical stress affect weight gain. When the body experiences eustress (positive stress) as in exercise, or distress (negative stress) as in worry, the body releases powerful hormones to combat it. Fusion Workouts offers an approach to fitness, yoga, Pilates, and barre that offers efficient ways to gain strength, muscle definition and endurance, flexibility, and balance. Combine fitness, Pilates, yoga, and barre, and what do you get? An incredible workout that will engage you, challenge you, and change the way you exercise. Welcome to Fusion Workouts: Fitness, Yoga, Pilates, and Barre, the program shaped around your preferences, needs, and goals. You’ll discover an approach combining four disciplines that will help you gain strength, muscle definition, flexibility, balance, and overall mind–body health. Fusion Workouts guides you through a five-step system accounting for your fitness level, goals, time available, activity preferences, and more. Then select from 15 ready-to-follow workouts, or mix it up and create your own. You’ll find more than 100 exercises and poses along with easy-to-follow guidelines for sequencing them for maximum efficiency, effectiveness, and enjoyment. More Pilates and yoga with less barre? Less yoga and more fitness? No problem. This is your workout! 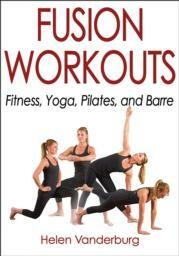 Chapter 1 What Are Fusion Workouts? Helen Vanderburg, BPE, is owner of Heavens Elevated Fitness, Yoga and Spin Studio and the creator and program developer of Fusion Fitness Training. With a career in fitness beginning in 1982 and experience as a group fitness instructor, yoga teacher, Pilates teacher, personal trainer, and educator, she is an innovator in the fitness industry. She has taught and trained instructors on fusion exercise and Fusion Fitness Training since 2000. Vanderburg is a highly respected leader and conference speaker at regional, national, and international events, presenting at more than 20 conferences annually. Vanderburg holds a bachelor’s degree in kinesiology physical education and is certified in yoga, Pilates, TRX, ACE group fitness, and several CanFitPro fitness disciplines. She has received numerous industry awards, including the IDEA Instructor of the Year in 2005 and CanFitPro Presenter of the Year in 1996, 2006, 2013, and 2015. She’s also a consultant, education developer, and spokesperson for some of the world’s most influential fitness companies, including Schwinn Cycling, BOSU, and Total Gym. Vanderburg has been a fitness columnist for numerous magazines and newspapers, including Fitness, Self, Chatelaine, Flare, and the Calgary Herald. Vanderburg has a lifelong passion for fitness and sport. In 1973 she became Canada’s junior champion in synchronized swimming. At the 1978 World Aquatics Championships in Berlin she won the gold medal in both the solo and duet categories. In 1978 and 1979 she received the Elaine Tanner Trophy and in 1979 she was named Canadian Female Athlete of the Year. Because of the Canadian boycott of the 1980 Summer Olympics in Moscow, she was unable to compete in the first Olympic Games to include synchronized swimming. She was inducted into the Canada Sports Hall of Fame in 1983 and the International Swimming Hall of Fame in 1985. Vanderburg lives in Calgary, Alberta.